The contest for the runners-up spot in the Morning Triples league at Louth Indoor Bowls Club will be decided this week when the final two rounds of games are played. Kestrels have already won the title but they ruined Mudlarks’ hopes of making a late bid for second spot with a 15-13 win after being 8-2 behind in an excellent game. The champions were involved in another cracking game against In A Minute, who had led 10-4. But the game was poised at 13-13 going into the final end where In A Minute’s skip Gordon Sharples produced a brilliant draw shot with the final delivery of the game to earn his team a 14-13 win. Second-placed Matelots were held to a 11-11 draw by Two Plus One who fought back from 9-0 and 11-3 down to win the last six ends. Matelots then had a nervy time against Puffins before winning 16-12 to open a one-point gap ahead of Otters, who had earlier eased to a comfortable victory over Puffins, but then lost the chance to pinch second spot when losing 10-8 to Two Plus One. Fourth-placed Dreamers had a nightmare week, probably blowing their chance by losing both their games. They were well beaten by Wasps and then fell asleep at the end of their game against Wishfuls when losing 11-8. This week also sees the final of the Australian Pairs when Tony Powell and Liz Draper take on Malcolm Pearce and Rachael Stanley. 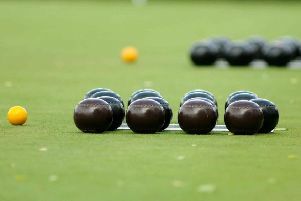 Last weekend saw the the first of three consecutive open weekends at the club and a good number of people came along to see what the game of bowls was all about. Anyone interested can call Louth 609 227 for more details.